8 miles on the Clinton River Trail this morning. It was a cool and crisp 20 degrees out. Yikes! Dan over at Knuckle Lights was kind enough to send me a set of their Knuckle Lights to test out. It took a few weeks to get these out to me since he had them on back order so that tells you the kind of demand they have had for these. So many of us these days are running in the dark. This is a product to be used for anyone that needs to run in the dark. For me, that is all the time. I might have a brief period in the summer where part of my run has sunlight but I always start in the dark. 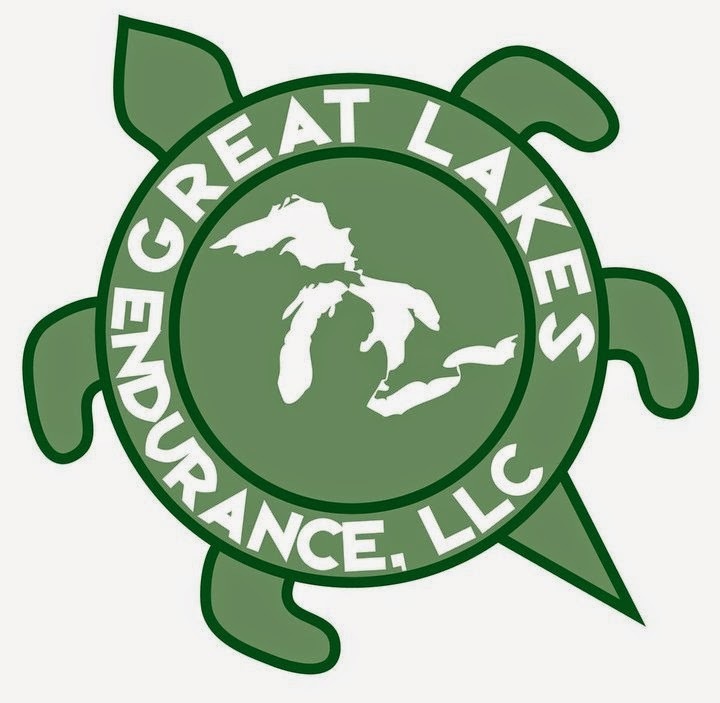 Unfortunately, these days, with the winter season coming upon us, my run has been completely in the dark(for some time now) since I'm starting at about 5am. So what are Knuckle Lights? They are basically an alternative to a flashlight or a headlamp. I have tried carrying a flashlight in the past. Have you ever tried it? It's way too hard and you are constantly switching hands because it's not comfortable to hold it - even for a smaller flashlight. 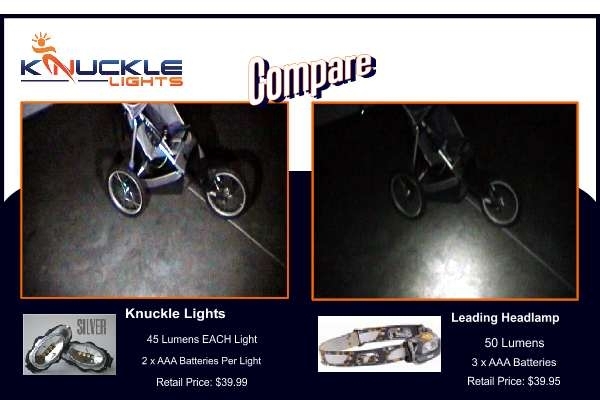 Knuckle Lights solve that problem. 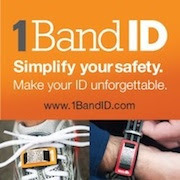 They are essentially a bright light that you hold in your hand but they are actually comfortable. They even come with batteries! I have done numerous runs with them since I got them. The light itself is extremely bright(45 Lumens each!!!). Actually the light is bright even if you just used one of them but when you are using both of them, I felt really safe! Together, I felt like I was lit up like a Christmas Tree which is really what you want. Usually, I judge the effectiveness of the lights by the way cars handle me coming. You could tell that they could see me pretty far away since they moved over to the other side of the road much sooner than usual. I always run in the street(in subdivisions) and always in the opposite direction of traffic so I can see cars coming towards me. 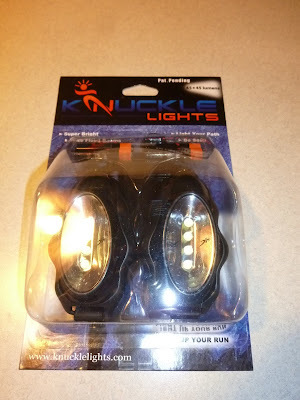 I could also really see using the Knuckle Lights when running on the trails where it's pitch black. Because of their extreme brightness, these would be a much better alternative to the headlamp or flashlight. Another thing the lights do is really help you see quite well. I felt like I had spot lights in front of me. In fact, the light was bouncing off my clothing to so it reflected my clothing as well to make it even easier to see me. In addition, since you are holding them in your hand, they move a little which helps drivers see you even more. While I do like using my headlamp, these are much brighter than the headlamp when you use both of them. Here's a quick picture to show how you are supposed to wear them. Really very simple design and because of how you hold them, they fit in with your running form so you are not constantly thinking about them. I was even still able to use them when I carry my water bottle in one hand. Of course, since you are going to be wearing these in winter, they need to be somewhat weather proof. No issues here. I ran with them in the rain and also in a couple snow storm and they performed perfectly. 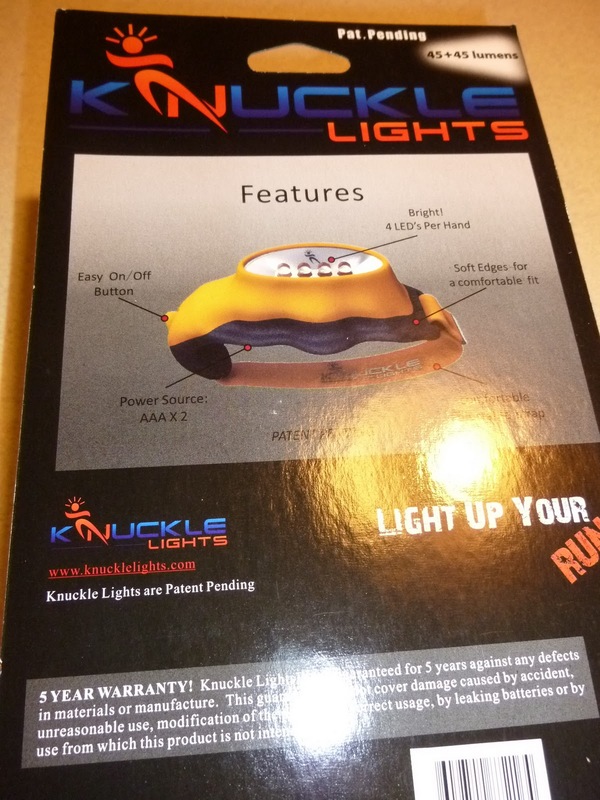 There is a simple button on the side of the Knuckle Lights to make them easy to turn off and turn on when you are done with them. 3) Helps you run at a time you would not be able to. 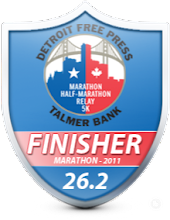 Probably the biggest drawback is that it's still something that you have to carry in your hand to run with. It's no fault of the product itself but some may not like that. While I don't feel it's a big issue when running 10 miles or less, I'm not sure I'd want to carry these on a 20 mile run. Then again, not many people are going to do a 20 mile training run in the dark either. I know I wouldn't be. As I mentioned on my holiday gift guide, here's a coupon code good for my readers for $5 off the purchase of these lights courtesy of Knuckle Lights: Code is KL020 In addition, the company offers free shipping. 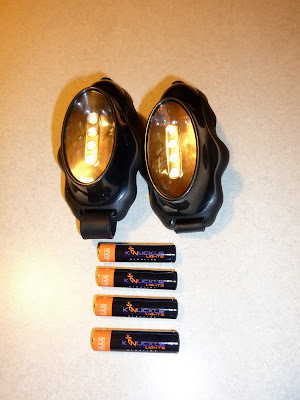 Overall, I think you will enjoy using these on a daily basis(and will be safe) for your runs that are in the dark. * Note: I was offered a complementary pair of Knuckle Lights in exchange for a review of their products. I was not required to give an opinion on these other than my own. I just won a pair of these and am so excited to try them out!! I swore that if I didn't win the giveaway, I would have bought them myself since they seemed to useful (and I haven't gotten used to wearing a headlamp). Thanks! OMG...those knuckle lights are definitely a "why didn't I think of that" idea! I hate wearing headlamps but I could definitely see myself using these. I bought a pair about 4 months ago and they are fantastic. I run in rural area where I only see one street lamp on an 8 mile run but see a lot of speeding pickups on little country roads. I feel much safer using these and they are far better than any other light I have used. My only complaint was that the included batteries did not last very long. I replaced with name brand batteries and they last much longer. These look like exactly what I need! I only run in the dark, but I hate headlamps. Thanks - I just used the coupon code! Anonymous - hope you like them! You will!